Pescatarian in Japan – Where Is Amber? My one year anniversary of arriving to Japan has just passed, and I have a lot to be grateful for. I have a job, a car, a bike, an active social life, and a surprisingly big apartment, which I especially appreciate because it’s the first time I’ve a kitchen entirely my own. In the past few years, I’ve started to love cooking, and my interest in veganism is adding another layer to life here. Green smoothie with walnuts and avocado. Eggplant tofu miso dip. I make it in my rice cooker and use a stick blender. Thanks dad! Tofu white bean dip with cabbage, carrot, daikon, and goya. Unlike vegetarians, who avoid eating animals, vegans avoid all animal products – no dairy, eggs, gelatin, honey, leather, etc. While I’d like to be fully vegan, I currently avoid meat and dairy, and only occasionally eat fish. I love my way of life. I buy veggies from local farmers and fruits from the discount shelf at the grocery store. When I eat out, sometimes I have fish, but only for work parties or at restaurants where there is no other option. I also bring my lunch to school every day, which I enjoy making and preparing. It’s like a present for myself. My Japanese coworkers, students and friends notice my abnormal eating habits, and often they ask me about it. Usually I just say, “Niku tabenai,” or “I don’t eat meat.” Sometimes they follow up with, “Why?” and I say something about “Dobutsu” and “Tomodachi.” (Animals and Friends.) If the person who asks me speaks English, I’ll say, “I don’t want to kill anything,” although my honest answer is a bit more complex. I’ve been thinking a lot about this recently, because I worry that sometimes I offend people with my beliefs. I hope I haven’t lost any potential friends by sounding too harsh about my feelings. How can I say what I really feel without sounding judgmental? The truth is, this is one of my most entrenched beliefs, and I am really passionate about it. If anyone cares to know my deeper reasoning, here I’ll present a more multifaceted answer. When I was in 7th grade, I did a research project on animal cruelty. During that project, I realized that every hamburger comes from an animal that is imprisoned and tortured before its death. I decided then that I didn’t want to be part of that cycle anymore. And recently my beliefs were further entrenched when I watched a documentary called ‘Cowspiracy’ that details the disturbing process of making meat. Also, when I spent two and a half years traveling in New Zealand, Australia and South East Asia, I volunteered on about 10 farms. I made some close relationships with animals on these farms. I lived on a small family farm near Invercargill, New Zealand for about 3 weeks. 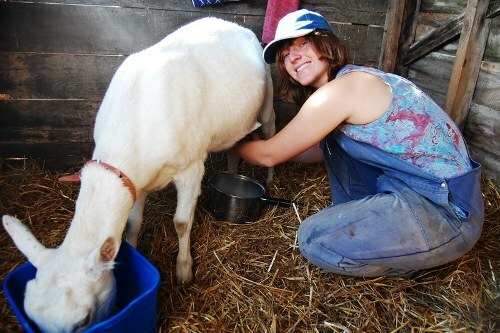 I learned how to milk a goat by hand, and it became one of my morning tasks. 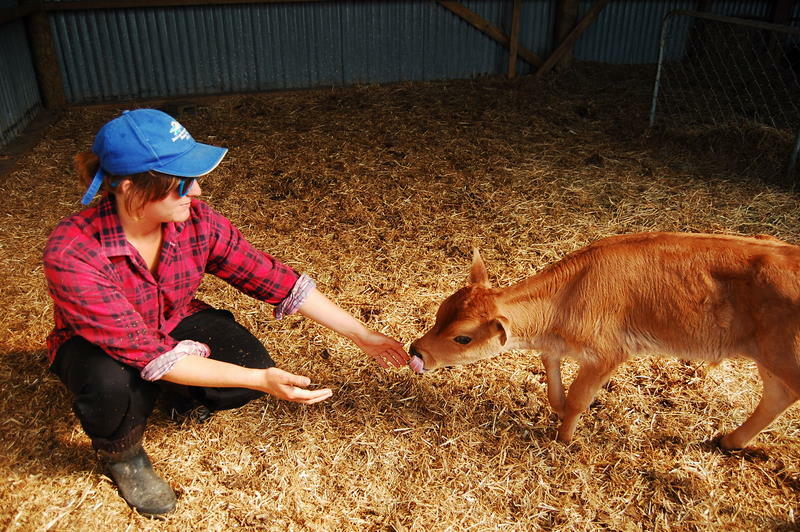 I fed this baby cow whose name was Jack, who was later killed for veal (baby cow). Jack had a distinct personality. When I first met him, he wouldn’t come near me. But his fear waned when he saw I was bringing him food. After a week, he became much friendlier. Jack’s mother died when he was born, and they took her away in a truck. Jack, only a few hours old, chased the truck down the road! Feeding the baby cows was a joy. Even though there were 8 places for drinking and 8 calves, they always shove and headbutt each other. They are such sweet, innocent creatures. Since I would never kill one of these animals myself, why should I eat animals that other people killed? I think if someone is going to eat meat, they should have to experience killing an animal themselves. My ideas about food and wellness are profoundly influenced by my two month stay in the Philippines. I volunteered at Bahay Kalipay, a Yoga and Detox Retreat in Puerto Princesa on the island of Palawan. When I was there, we only ate raw food. 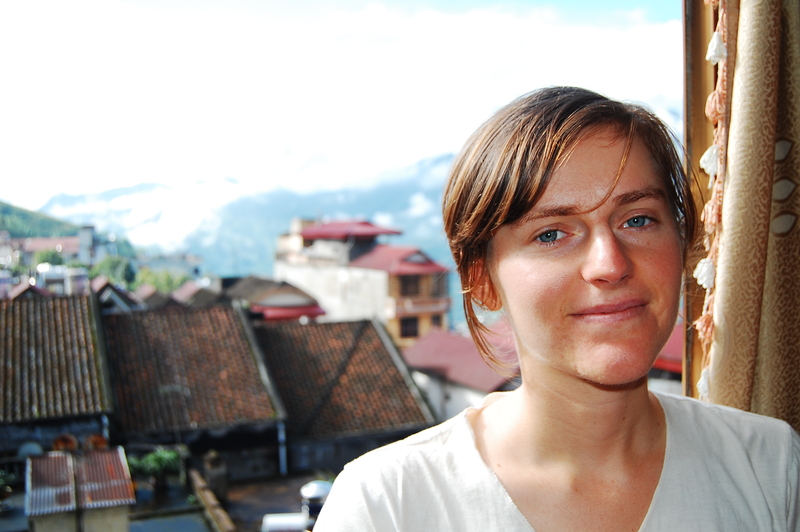 I lost the weight I had gained from the street stalls in Thailand and Malaysia (where I had taken a brief hiatus from strict vegetarianism), and more importantly I felt a strong and spiritual connection with the food I was eating. The food, yoga, and daily routine was a gateway into a conscious way of living. I felt like I had superpowers. Meals were served family style. This was Italian night! This fruit roll-up was a special breakfast! These salads were the bomb!!! Pizza for dinner! The base was made with a dehydrator. The day began at 6am, where we would drink a big glass of lemon water to alkalize our bodies, and then do oil pulling for 20 minutes. (Oil pulling is swishing coconut oil in your mouth, and draws out toxins from your mouth.) Next, we would take a yoga class, drink more water, and then eat breakfast at about 8. A few hours later, a gong would ring, and we would gather again for green smoothies. In the Philippines, this morning routine was crucial. Now, in Japan, I try to exercise every morning before work (and sometimes after, too) and I have a green smoothie for breakfast almost every day. At my last job at the Santa Barbara City College Writing Center, one of my students asked for feedback about her paper on a book called The Blue Zones. After I helped her, I was inspired to read the book. The Blue Zones are 5 places in the world where people live to be over 100 – Okinawa, Japan; Ikaria, Greece; Sardinia, Italy; Nicoya, Costa Rica; and Loma Linda, California. Author Dan Buettner visited these places and interviewed their elderly, examined their lifestyles, and found what they had in common. The healthiest people in all these countries have a strong social community, an active lifestyle, and a 95% plant based diet. Here are some photos of the food I’ve enjoyed in the past year. I went hiking with my friend David and we stopped at a farm along the way, and the farmer gave us free gnashi! A beautiful meal that I enjoyed at a friends house… not vegan but with lots of vegan options, and only including seafood. Our lunch at the top of the mountain. Unfortunately the can of beans had sugar in it. My egg and avocado bowl. Apple, cashews, and cabbage snack at school. Green smoothie ingredients: frozen banana, frozen broccolio, half an avocado, big handful of spinach (or any leafy green) and a big chunk of ginger. Plus water! I converted my sister, now she eats them! I’m not a legitimate vegan because I still eat ice cream occasionally. Salad with cucumber, pickled miso garlic, and a bean and rice concoction. In the third-year textbook at my school, there is a section about deforestation of the Amazon Rain Forest. I researched the issue and made an interactive presentation for students. One question I asked them was, ‘Why do you think the forest is being destroyed?’ Their answers were varied, from ‘building a new mall’ to ‘making paper,’ but I found that the leading cause of deforestation is meat production. According to a report from the Food and Agriculture Organization of the United Nations, 80 percent of the deforestation in the Amazon have been covered by pastures for raising cattle. There are people in many countries who don’t have enough food to eat. Many vegans and vegetarians argue that we should reallocate the food we are feeding animals and give it to the hungry people all over the world. It takes so much water and land to raise animals that it’s shocking to me that the world is still relying on meat. See the following infograph from PETA for more details. Even if it’s not happening exactly where I live, I’m glad some parts of the world are starting to wake up to the issue of animal rights. I’m not completely alone; veganism is gaining popularity in the US and Britain ! However, there is one great restaurant about an hour drive from my apartment called Fukamidori that is completely vegan and with a menu that changes weekly. Who wants to go there with me? A delicious and filling meal at Fukamidori! Thanks for reading! Any opinions or questions are welcome. Please leave a comment! Thanks for sharing this. I understand your veganism better and it gives me a lot to think about. I have been trying to eat less meat. 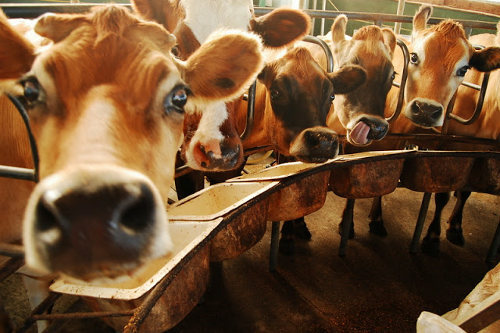 I am concerned about the environmental impact on meat production, as well as the unsanitary process of meat production. The addition of ammonia laced “pink slime” in ground beef to the newly approved shipping of live poultry to China for processing before it us shipped back to the US. I have much to think about. Hi, Amber! Thanks for the good read. Vegetarian diet is good in many ways. After all, we have to be grateful to the food that provides us with life. Every time when I say “itadakimasu,” I say it meaning “thank you” to the food. I didn’t eat ground beef for TEN YEARS after reading just two chapters of “Fast Food Nation”. I eventually decided to eat it again but I don’t very often, a few times a year maybe. I respect you a lot, Amber, for being thoughtful of not just what you put in your body but what effects different foods have on the planet and on society. I’m glad you’re living life on your own terms!